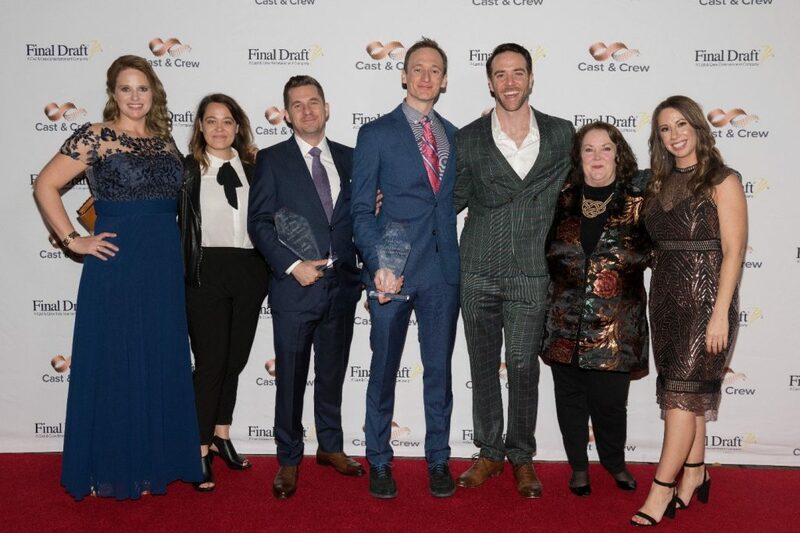 Earlier this year, I had the chance to attend for the second time the annual awards ceremony for Final Draft’s Big Break Screenwriting Contest. The Writers’ Program frequently partners with Final Draft in various capacities, such as offering discounted screenwriting software to current students, our past exhibition at San Diego Comic Con, and as prize sponsors to their contest, to name a few. The Big Break contest has just launched its 20th year and is one of the largest screenwriting competitions in the world. Each year, thousands of writers submit their material across 11 film & TV categories. $100,000 in prizes are doled out among winners in these categories and two Grand Prize winners are flown to LA for a “water bottle” tour of Hollywood (slang for general introductory meetings with prominent industry executives). In 2017, Writers’ Program contest winner and Certificate graduate Greta Heinemann took home Final Draft’s top honor for feature film writing. She and other 2017 Grand Prize winners Hana Callaghan & Chad Callaghan returned this year to present awards to the 2018 honorees, Jeff Cassidy and Myles Reid (photographed below). In 2018, Writers’ Program student Justin Best advanced to the Top-3 of the Feature Film Sci-Fi/Fantasy category, and many students have placed in the semi and quarter-final past iterations. We strongly encourage all students with completed scripts to apply, as the esteem and exposure is absolutely worthwhile. From left to right: Shelly Mellott (Vice President of Sales & Marketing), Greta Heinemann (2017 Feature Grand Prize Winner), Jeff Cassidy (2018 Feature Grand Prize Winner), Myles Reid (2018 TV Grand Prize Winner), Hana Callaghan & Chad Callaghan (2017 TV Grand Prize Winners), and Kala Guess (Contest Director). Image: Temma Hankin Photography. This year, the ceremony – held on the Paramount Studios lot – also acknowledged three professional writers. Boots Riley (Sorry to Bother You) and Tanya Saracho (Vida) received the “New Voice Award” in film and television writing, respectively, and Callie Khouri (Thelma and Louise) was inducted into the Hall of Fame. Boots Riley gave an impassioned speech about striking a balance between art and commerce, and writing one’s truth. Tanya Saracho touched on her journey as a Latinx writer, working her way up from a Wallgreens market announcer, to TV staff writer, to finally becoming a showrunner on her own series. Callie Khouri lamented how even as a professional writer, she had to overcome feelings of being a fraud, not good enough, and how important it is to tell stories that matter and make your voice heard. In fact, one central theme echoed throughout every speech of the night: voice. Every writer, from rookie to veteran, championed finding the courage to be vulnerable in one’s writing, to be personal, to tell stories that matter, to write one’s truth, and to have a voice, because there are people out there who want to hear it. For a video highlight reel of the star-studded night, click here. All in all it was an inspiring night, and we thank our partners at Final Draft again for the opportunity to be a small part of it. Write on! Thanks to Writers’ Program staffer Jeff Bonnett for this post and his attendance at the event! For the 2019 Big Break contest, the final entry deadline is July 23rd. Tiered entry fees and deadlines apply between those dates. For information on Final Draft discounts for current students, Writer’s Program Screenwriting courses (Onsite & Online), or the annual Writers’ Program film & TV writing contest (deadline 4/1/19), email student advisor Jeff Bonnett at jbonnett@uclaextension.edu or call 310-825-9415.